The common approach for fatigue life analysis is using S-N curves based on nominal stresses (i.e. average stresses in the net section). Depending on the severity of the stress concentration (Kt) in the structure, a S-N curve is then selected that corresponds with the actual structure. In the diagram below a few S-N curves are shown for different Kt values. The larger the Kt, the lower the fatigue limit and the steeper the S-N curve (smaller value of k in the S-N curve equation (Sa^k)*N=c). Very often, structural analysis is performed using Finite Element Analysis (FEA). Such an analysis gives local strains and stresses. Quite often, FEA is used because of the complexity of the structure. If so, nominal stresses and Kt are difficult (or impossible) to determine. Under those conditions, fatigue analysis using local stresses looks attractive, using the peak stress at a stress concentration as local stress. In case the fatigue analysis is performed using local stresses, the S-N curves based on nominal stresses cannot be applied, instead S-N curves based on local stresses must be used. In the diagram below, a set of S-N curves is shown. These curves are derived from the S-N curves based on nominal stresses shown above, by multiplying the nominal stresses by Kt to obtain the local stresses. By doing so, an analysis using local stresses will give the same results as an analysis using nominal stresses, under the condition that for both analyses the S-N curve for the same Kt value is used. This condition however gives a problem. The attraction of using local stresses in the fatigue analysis is based on not knowing the Kt. The actual problem is the fact that a local stress can be any combination of nominal stress and Kt, each giving a different result in a fatigue analysis. Just knowing the local stress is unfortunately insufficient input for the fatigue analysis. The S-N curves based on local stresses show different fatigue limits and different gradients for different Kt values. 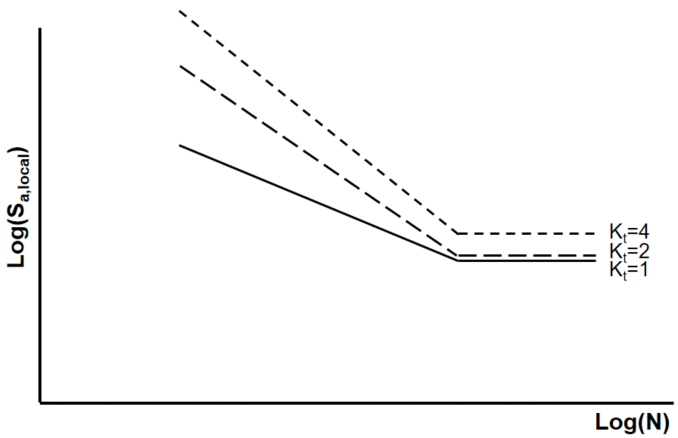 The difference in fatigue limit can be accounted for by making corrections for notch sensitivity. But such a correction is not possible for the gradient. When looking into the S-N curves, the gradients for Kt=2 and Kt=4 may look at first sight not so different, the S-N curves however are plotted on log-log scale. Using the wrong Kt (i.e. wrong gradient) in the analysis may lead to significant errors in the outcome. Many codes and FE fatigue tools use a fixed gradient with k=5 in de equation (Sa^k)*N=c. This is oversimplified. The value of k depends on the stress concentration, but also on the stress ratio of the stress cycle as will be discussed in part 2 of this blogpost.